Lanterns are set afloat for the annual Lantern Floating Ceremony at Ala Moana Beach. 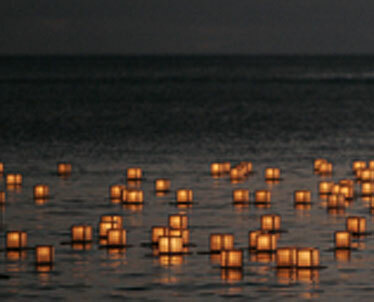 The lantern floating tradition, known as Toro Nagashi, is an aspect of the Japanese Buddhist celebration of the Obon season, which remembers ancestors. Shinnyo-en Hawaii will sponsor its 10th annual lantern floating ceremony Monday at Ala Moana Beach Park, a Memorial Day observance that drew nearly 30,000 people last year. Some 1,600 lanterns bearing prayers will be launched from the shore near Magic Island in the program from 6:30 to 7:30 p.m., organized by Na Lei Aloha Foundation, the community outreach arm of Shinnyo-En. Participants may write their prayers for deceased family and friends at a booth that will be open from 1 to 6 p.m. Multiple prayer requests are attached to each lantern. The Rev. Shinso Ito, head of the Japanese-based Buddhist association, will lead prayers for peace and for the dead, in a program that will be telecast in Japan and at other Shinnyo-en centers in the United States and elsewhere. The 6:30 p.m. program will include performances by singers Keola Beamer, Raiatea Helm and Amy Hanaialii and dancers of Halau Hula Olana and Halau Na Mamao O Pu'uanahulu. Free parking will be available at the Hawaii Convention Center after 1 p.m., and shuttle buses will provide free transportation to and from the park after 4 p.m. The lantern floating tradition, known as Toro Nagashi, is an aspect of the Japanese Buddhist celebration of the Obon season, which remembers ancestors. It is usually observed in July and August. Ito decided to combine the Buddhist tradition with the American observance of Memorial Day. People from different cultures and faiths have embraced the idea of coming together to remember the dead and pray for peace, said the Rev. Given Tokunaga, of Shinnyo-En Hawaii.